What's New for the 2018 Subaru Forester? 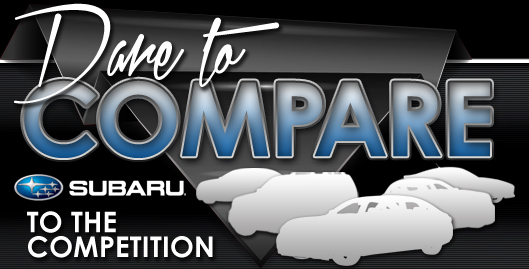 The Subaru Forester enters 2018 as this year's winner of ALG's Residual Value Award for best overall value in its class. Engineered with safety, longevity and functionality in mind, it's no wonder 98 percent of all Foresters sold in the last 10 years are still on the road today. Forester goes dark in 2018 with the unveiling the of the new Black Edition 2.5i Premium model. The Black Edition features black 18-inch alloy wheels, custom black cloth and synthetic leather interior and a sleek black trimmed exterior. Also new for 2018, Subaru's Active Torque Vector is added standard to the turbocharged Forester 2.0XT model line. Forester's Eyesight Driver Assist Technology gets a boost with the additions of automatic reverse braking and automated high-beam assist. 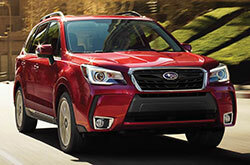 Eyesight Driver Assist is now available standard on Forester Touring models. 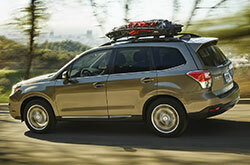 Like all Foresters, the base 2.5i comes standard with Subaru's Symmetrical All Wheel Drive Boxer engine. The 2.5i also features an ample 8.7 inches of ground clearance and Vehicle Dynamics Control technology for maximum traction on and off the road. The 2.5i Premium comes equipped with features such as 17-inch alloy wheels, power panoramic moon-roof and an automatic climate control system. 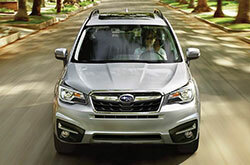 Subaru's Eyesight Driver Assist technology and power rear gate are available options for the 2.5i Premium. 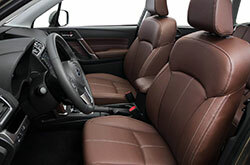 The 2.5i Limited comes standard with comforts like the all-weather package, fog-lights and leather-trimmed interior. It is also equipped with Blind-Spot Detection and Rear Cross-Traffic Alert, fortifying the Forester's best-in-class integrated safety network. The well-equipped 2.5i Touring features 18-inch alloy wheels and LED responsive headlights. With an 8-way power driver seat with memory and heated steering wheel, the 2.5i Touring model can tackle the most difficult terrain in style. The 2.0 XT Premium's turbocharged, direct-injected 2.0-liter Boxer engine comes standard on all XT models, along with 18-inch alloy wheels. 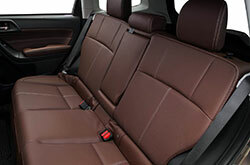 The XT Premium is equipped with the All-Weather Package that includes heated seats and mirrors, sport design front fascia and a leather steering wheel and gear-shifter for added style and comfort. The top of the line 2.0 XT Touring trim comes standard with the XT turbocharged Boxer engine as well as Torque-Vectoring Technology for increased handling and performance. In addition to the comprehensive list of features throughout the Forester line, the 2.0 XT Touring comes standard with LED steering-responsive headlights, dual-zone climate control and a heated steering wheel. All Subaru Foresters feature Subaru's Symmetrical All-Wheel-Drive Boxer engine and are available in both 6-speed manual and Lineartronic CVT automatic transmission. The horizontally aligned engine design minimizes vibration, while maximizing performance, efficiency and longevity. The standard 2.5-liter, 4-cylinder engine produces 170 horsepower, 174 pounds of torque, and delivers up to 1500 pound of towing capacity. With an impressive, up the 32 MPG* highway, the Boxer engine combines economy with rugged off-road performance. The XT model line showcases a turbocharged, direct-injected 2.0 liter, 4 cylinder engine which cranks out 250 horsepower and 258 pounds of torque. At Mototrend's testing facilities, the XT was clocked doing an impressive 0 - 60 in 6.8 seconds, with a brake distance of 115 feet. Subaru's Eyesight Driver Assist technology uses the Forester's wide array of radar sensors and cameras to detect and avoid collisions. Features like automated Pre-collision Braking, Blind-Spot Detection and Rear Cross-Traffic Alert are all seamlessly integrated into the Forester's safety network to bolster overall safety while optimizing driving efficiency.